The ladies at Papertrey Ink issued a challenge on Day 13 of their Anniversary Celebration to make our own homemade embellishments. There have been some other great challenges this week, but I didn't have time to participate in all of them. This challenge was one that I had been meaning to try. I have poked around Etsy and seen some of the cute, handmade embellishments there, and gained inspiration. Also, I bought some felt from Heather Bailey's website. It comes in pretty colors, and has some wool in the content. So, it is definitely better than the box store felt. I also used my package of buttons from Creative Cafe and some foam pieces from American Crafts. And, I pulled out my Sizzix, Quickutz and Nestabilities dies. They all seemed to cut the felt well, so I'll definitely be trying this again in the future. So, here are my creations. I took my color cue from the button package...red, pink and a warm sunshiny yellow. We are a couple months away from Spring here in Illinois, but these warm flowers make it seem like it's just around the corner! I have one more post tomorrow with a couple of last Valentine's Day cards. I've been following along with Nichole Heady's blog for the Anniversary festivities. They had a challenge to use the emboss resist technique. I decided to make a card this evening using this technique. I also just used the scraps of paper and a felt flower that I had laying out on my table, left over from other recent projects. It was kind of fun and freeing to just put it together and not think about it too much. I also like the combo of the Background Basics Text Style II and the large dots from Polka Dot Basics for the emboss resist. I'll be using that combo again! I was also inspired by the color combo on Melissa Phillip's Blog here. Can't wait to see what everyone else made. Here is my last Valentine's day card for this series, using one more Pure Innocence stamp by My Favorite Things and Copic Markers. I really enjoy coloring with these markers...I feel like a kid! And, I used a new scallop border punch that you can get free from Stampin' Up right now during Sale-A-Bration with a $50 purchase. This is the first time they have offered a punch in the free lineup. 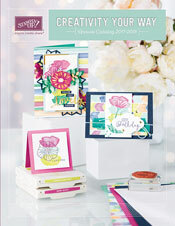 It has a matching corner punch in the Occasions Mini Catalog also. Check out my Stampin' Up website for more details. I hope you enjoy this card. I'll be back to post some more about my Project 365 Album soon. Here is my next card in a series of 3 using the Pure Innocence stamps from My Favorite Things and my Copic Markers. This one also uses the Heart Charm die from Sizzix, this time the actual charm instead of the negative image, and a heart eyelet die as well. I added a crystal brad for some bling effect, and used a corner punch to make the large scallops along the bottom edge.